How can the risks of construction be minimised? “We kill about a person a week in construction” was the sobering statement from Head of Loughborough’s Construction Health and Safety Research Unit, Alistair Gibb, in his TEDx Loughborough talk in 2013. Gibb then explained the poor record of construction worker deaths, particularly during Olympic stadium building, which resulted in 29 fatalities in construction for the five games from Barcelona in 1992 to Bejing in 2008. As far as the 2012 London Olympics was concerned, Gibb shared that this was the Olympic record that Lord Coe really wanted to break, being adamant that “no one should die or be harmed” in the building of the London Olympic Stadium. But with fatal accidents in construction industry being double the average of other sectors and with separate incidents and injury commonly accounting for around 2.2 million working days lost each year (HSE, average across 2013-2016) the construction industry is one of the riskiest out there … but what are the risks, and how can they be minimised? Unstable working surfaces, and particularly those off the ground, can be commonplace on construction sites. Add to this the multiple risks from restricted mobility and accessibility in high up places, plus the chance of human error, misuse or failure of safety equipment and it becomes apparent how falls from height accounted for 19% of the 65,000 non-fatal accidents on construction sites in 2015/16 and 25 worker deaths in 2016/17. Minimise risks by: implementing training in safe working practice; use and maintenance of PPE; installation of guardrail and fall protection systems; ensuring equipment is fit for tasks, ie: using the correct ladder / equipment as appropriate. Construction involves buildings going up and coming down, as well as excavations and the building of trenches. At any given time, collapses could occur in excavations and trenches, scaffolding and walls, through undermining, dangerous structures and accidental collapse as structures are installed, erected or demolished. Minimise risks by: implementing protective systems for trenches and workers using them; including exit and inspection, retaining and remedial structures; appropriate risk assessment of buildings at risk of collapse or demolition schedules. For guidance creating construction site risk assessments check out the SafeSite Facilities guide. With vehicles, plant, equipment and movement of materials, the busy nature of construction sites means that moving objects frequently results in on-site fatalities – 20 (11%) of deaths in 2015-16 alone. Particular risk comes from cranes and plant, including forklifts, plus the actual volume of traffic which can form part of a working site - let alone the heavy nature of the equipment and the materials they are transporting and dumping. On top of these factors, it’s also significant that movement usually occurs within sites which are uneven, exposed to the elements and difficult to manoeuvre around. 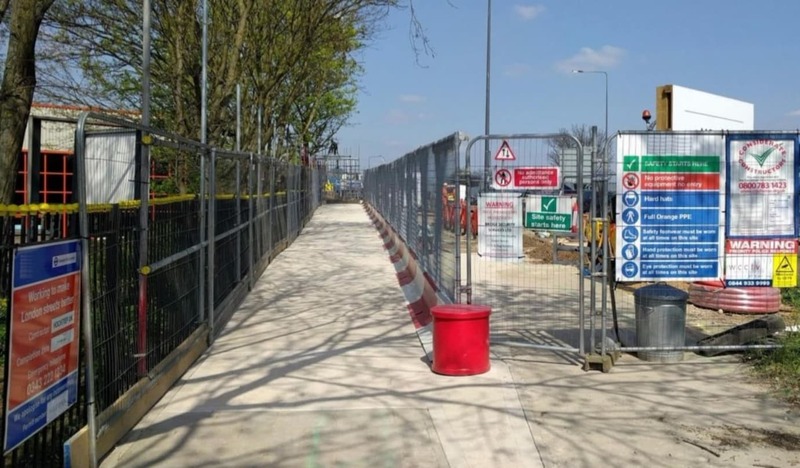 Minimise risks by: creating protected, designated working zones offering barrier protection to pedestrians; incorporating safety features to plant, such as rollover protection to plant including forklifts. In 2016-2017, electrical hazards, such as shocks and arc flashes or blasts caused 8 worker deaths and numerous injuries. Electrics are hazardous for all workers, not just electricians, as many workers need to consider safety when working close to underground or overhead cables and at height near power lines. When working practices are disorganised and rushed, such as undertaking electrical work in wet conditions or using non-professionals to complete electrical work, electricity presents additional hazards. Minimise risks by: allowing only qualified electricians to undertake electrical works; adding safety warnings and barrier systems to protect those working alongside overhead cables and power lines; implementing good practice for workplace organisation and phases of work, to reduce risk of incidents. Many construction site activities involve manual handling, a hazard which puts workers at risk of musculoskeletal disorders. These account for 64% of construction worker’s health complaints - over twice the amount of other industries, and are often the result of repetitive motion injuries, such as hand-arm vibration syndrome. Other physical disorders including back injury, commonly result from frequent use of vibrating power tools and ground working equipment. Minimise risks by: conducting full risk assessments and introducing protocols and working processes which eliminate risk of prolonged use; full and regular training in what constitutes safe manual handling; use of appropriate, well-maintained lifting equipment, including PPE. Construction involves the use of innumerable tools and materials, many of which are potentially hazardous for workers. Failure to use PPE correctly, or using damaged or inadequate PPE can mean that workers are exposed to harmful materials such as asbestos and long-term risk from dust particles (emanating from plaster, brick, stone, cement). Unexpected collapse also means exposure to harmful materials whilst the repeated handling and use of toxic substances such as adhesives, solvents, paints and other corrosive chemical solutions also presents risk. Exposure to such harmful materials can lead to a range of respiratory conditions, including COPD, asbestosis, asthma and silicosis, whilst harmful corrosive substances can lead to visual and mouth problems. Minimise risks by: implementing protocols for correct use, checking and maintenance of PPE; full risk assessment which includes storage and handling of harmful materials as well as good practice methods of movement, disposal and clearing of harmful materials; published emergency protocols to follow in the event of accident and spillage, to minimise risk and exposure to staff. The construction site working environment is busy and noisy. Sudden loud volume can be hazardous for workers, but it’s also exposure to long-term, repetitive sounds such as drills and compressors which can lead to short or long term problems, including hearing loss. Construction site noise can also present a distraction which can result in accidents. Minimise risks by: correct use, checking and maintenance of PPE; additional noise risk assessments for workers and the public; role-specific risk assessment for workers undertaking particularly hazardous activities, such as using noisy ground-breaking equipment. Hazards affecting balance account for the majority of work-related injuries in construction - 23% of all injuries in 2014/15 resulted from slips, trips and falls. Although it’s not surprising that construction sites involve uneven surfaces and unstable terrain, it’s surprising that so many accidents happen when many could be prevented. Minimise risks by: keeping walkways and stairways free of wet, debris and materials which could cause slips; use temporary surfaces to cover holes and excavations; deploy non trip footings; use warning signs; implement protocols for removing spills and for working in bad weather. Yet despite all these and more construction site hazards, the London Olympic Park was constructed without fatalities. In fact, the Olympic Delivery Authority’s success in delivering this fatality-free major construction project was rewarded with a special Diamond Jubilee award from RoSPA. So what else did the ODA do to minimise risks? So as well as looking at the hazards presented by construction sites and implementing rigorous risk assessment and management strategies, there is a clear message that whether you’re a construction worker, site manager or company owner, taking responsibility for safety and communicating safety protocols are crucial for improving safety in this hazardous industry. As such, the ODA delivered not just a stunning build and a new record of no fatalities during construction, but also results that the construction industry needs to continue to build on, in order to stop killing a person each week – across all construction projects.